Several nationalist parties and associations in Spain's Catalonia region have signed an agreement on what they call "a road map" to secession. They aim to implement the plan by 2017, if the coalition wins regional parliamentary elections in September. The Catalan nationalist party, Democratic Convergence of Catalonia (CDC) and the left wing Republican Left of Catalonia (ERC), as well as several associations have agreed to work on a new constitution and establish institutions to form the basis of a future state, should the parties win the election on September 27. The snap vote will "serve as a legal mechanism to determine the Catalan people's will," the independence movement members said in a document, published this week. The vote will act as a "plebiscite," the pro-independence candidates said. The September parliamentary elections have already been dubbed a de facto referendum on independence, since Madrid has blocked any other legal vote in the autonomous region with a 7.5-million population. Last year, Catalonia's President Artur Mas called for a "plebiscite election" involving pro-independence parties and civil society members. He called the poll a final battle for separation from Spain. 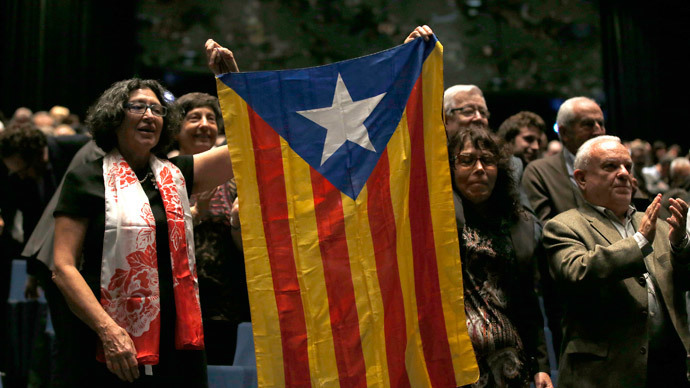 The region also held a symbolic referendum vote in November, which was ruled to be unconstitutional by judges in Madrid. According to the new document, the transition process "towards the declaration of a new Catalan state or republic" will start after the September elections, and will "culminate at the most after 18 months." A "mandatory referendum on the text of the constitution," and negotiations to determine the region's "new relationship" with Spain and the EU are also slated. The document was criticized by Madrid officials, with the country's Prime Minister Mariano Rajoy calling it "bad" for both Catalans and "all other Spaniards." "It breaks all the ties that have long linked us," the PM added, as cited by AP. EU officials have also previously warned that Catalonia would have to leave the European Union should it gain independence from Spain. Pro-independence sentiment in Catalonia has grown from strength to strength over the last few years, gathering momentum against the backdrop of financial crisis in the EU. However, some parties, who have previously expressed pro-independency views, are not participating in the latest "road map" agreement, with some having distanced themselves at the last moment, El Pais reported.